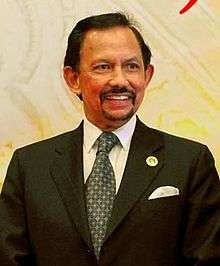 The Sultan of Brunei can be thought of as synonymous with the ruling House of Bolkiah, with generations being traced from the 1st sultan, temporarily interrupted by the 14th sultan Abdul Hakkul Mubin who in turn was deposed by a member of the House of Bolkiah. It is not clear when the house became known as the 'House of Bolkiah', and whether it was named after the current sultan Hassanal Bolkiah, or the 6th sultan Bolkiah.. The Sultan's full title is: His Majesty The Sultan and Yang Di-Pertuan of Brunei Darussalam. 1 Muhammad Shah / Awang Alak Betatar 1368 1402 Established the Sultanate. 2 Abdul Majid Hassan / Maharaja Karna 1402 1408 Died in Nanjing, China. 4 Sharif Ali / Sultan Berkat (Blessed Sultan) 1425 1432 No direct genealogical relation to predecessor, but was selected as he was the son-in-law of the previous sultan (Ahmad) and was well versed in Islam. 5 Sulaiman 1432 1485 Son of the previous sultan, Sharif Ali. Abdicated to allow his son Bolkiah to become sultan. 8 Saiful Rijal 1533 1581 Nephew of the previous sultan, Abdul Kahar. Castile War broke out between Brunei and Spain. 10 Muhammad Hassan 1582 1598 Younger brother of the previous sultan, Shah Berunai, and son of the 8th sultan, Saiful Rijal. 13 Muhammad Ali 1660 1660 Killed by his successor Abdul Hakkul Mubin, sparking the Brunei Civil War. 14 Abdul Hakkul Mubin 1660 1673 Started the Brunei Civil War by killing his predecessor Muhammad Ali, and was in turn killed by Muhammad Ali's grandson Muhyiddin who succeeded him as sultan. 15 Muhyiddin 1673 1690 Grandson of Muhammad Ali who avenged his death by killing his predecessor Abdul Hakkul Mubin, so ending the Brunei Civil War. 25 Omar Ali Saifuddin II 1828 1852 Brunei ceded Sarawak to James Brooke. Brunei ceded Labuan to British. 26 Abdul Momin 1852 30 May 1885 Brunei ceded northwestern part of Borneo to the British. 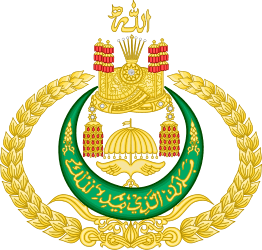 27 Hashim Jalilul Alam Aqamaddin 30 May 1885 10 May 1906 United Kingdom established protectorate over Brunei in 1888. 30 Omar Ali Saifuddien III 4 June 1950 4 October 1967 Abdicated; died on 7 September 1986. 31 Hassanal Bolkiah 4 October 1967 Present Brunei regained independence from the United Kingdom in 1984. The earliest historical record of the Sultans of Brunei is not clearly known due to the poor early documentation of Brunei history. Many elder members of the House of Bolkiah claim that their ancestors were the BaHassan and BaAlawi Saadah from Tarim and Hadhramawt in Yemen. In addition there has been an effort to Islamise the history, with the "official history" not matching up with verifiable foreign sources. The Batu Tarsilah, the genealogical record of the kings of Brunei, was not started until 1807. Therefore, much of the intepretation on history relied on earlier Chinese sources and legends. It seems that the early Sultanate of Brunei was dependent on Chinese support, and perhaps early Sultans were of Chinese origin. Furthermore the earliest Sultans may have been practising the Hindu or Buddhist religions, with early names indicating this origin. 1 2 "Prime Minister". The Prime Minister's Office of Brunei Darussalam. Retrieved 24 April 2011. 1 2 "Sultan-Sultan Brunei" (in Malay). 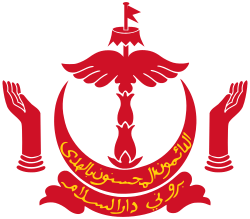 Government of Brunei. Retrieved 24 April 2011. 1 2 3 4 5 Elisseeff, Vadime (January 2000). "Chapter 8: A Brunei Sultan of the Early Fourteenth Century — A Study of an Arabic Gravestone". The Silk Roads: Highways of Culture and Commerce. Berghahn Books. pp. 145–157. ISBN 978-1-57181-222-3. Retrieved 26 December 2013. 1 2 "Brunei". 4dw.net. Retrieved 18 January 2015. ↑ "Malay History: What's Missing in Malaysian History Books". Malaysianunplug.blogspot.co.uk. Retrieved 18 January 2015. ↑ "The golden history of Islam in Brunei". The Brunei Times. Retrieved 18 January 2015.